It was announced that Lance Greig of San Juan Bautista won the “It’s All in the Sauce” contest at the 7th Annual Testicle Festival held in Watsonville on Saturday, September 26th. It was announced that Lance Greig of San Juan Bautista won the “It’s All in the Sauce” contest at the 7th Annual Testicle Festival held in Watsonville on Saturday, September 26th. The contest invites attendees to prepare and bring their favorite dipping sauces for everyone to try out with the Rocky Mountain Oysters served as appetizers. Lance’s sauce was the favorite of the sauces entered in the competition. Karen Pisturino of Watsonville won the coveted “Best Sauce Name” section of the contest. There was also a competitive horseshoe contest at the Testicle Festival. The winning team was comprised of Artie Vargas and teammate Billy Gonzales. 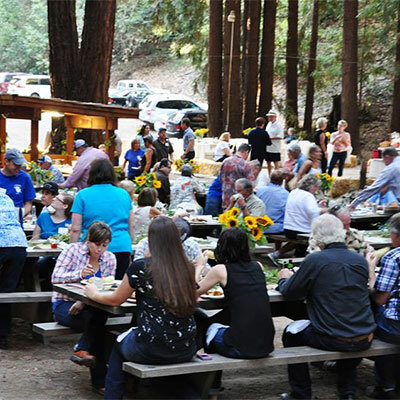 The Young Farmers and Ranchers Committee of the Santa Cruz County Farm Bureau held its 7th Annual “Testicle Festival at Estrada Deer Camp in Watsonville. The Rocky Mountain Oysters were served as hors d’ oeuvres and the sauces were enjoyed and judged by the record-crowd attending. A full chicken barbeque was served for dinner, with s’mores, made around the campfire, for dessert. The event also included a raffle, live and silent auction. If you haven’t tried a rocky mountain oyster, make sure to attend the 2016 event! © 2019 Agri-Culture	. All rights reserved. Agri-Culture is a 501 (c)(3) nonprofit organization, federal tax ID #77-0212413. Contributions are tax-deductible.